We Can Help Make Your Home a More Comfortable Place! Port’s Heating & Air repairs all makes and models of heating and air conditioning units. If you are in the market for a new unit, Port’s Heating & Air can install the best high-efficiency system for your needs. Based in Lancaster, SC, we’ll travel within a 40-mile radius to help you! Contact Port’s Heating & Air today to learn more! In 1989, owner Steve Port began working in the heating and air industry as a student at York Technical College. Two years later, he started working as an apprentice/service technician. He dedicated himself to learning as much as he could about heating and air conditioning systems and received his N.A.T.E. certification–the highest achievement for a service technician. In 1998, Steve and his wife Annette opened their own business. Port’s Heating & Air, LLC strives to be the best heating and cooling company in the region. We operate our business with honesty and integrity and we always keep your best interests in mind. 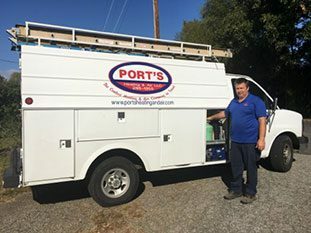 After 19 years of experience, Steve Port’s business has grown from one technician and truck to four technicians and trucks. Our customers have made this possible and we are committed to giving them the best service possible.